There’s a buzz of excitement at Estuary Estates this week as we launch our brand new website and we hope you’ll like it as much as we do. 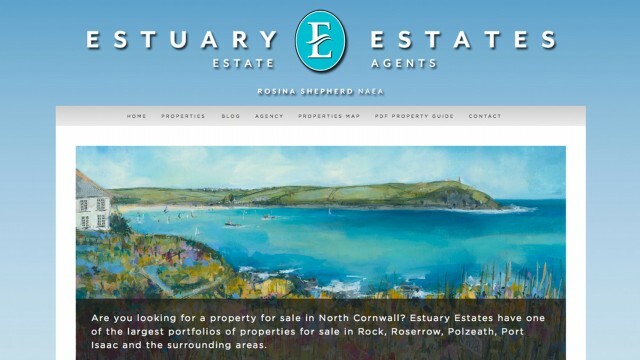 Our aim is not only to showcase some of the most prestigious and desirable properties in North Cornwall and in the best possible way, but also to evoke the true spirit of Cornwall itself. That’s why we asked our talented design team to come up with a look and feel that would conjure nostalgic images of bucket and spade holidays spent crabbing in sandy coves, walking on breezy cliff tops, of paddling and surfing and bird watching …and so many other simple pleasures from childhood. We think our colours and design reflect those wonderful memories, and echo the warmth and vibrancy of the region beloved by so many. On a practical level, we hope you will find our website easy to navigate, our search tools efficient and our property details informative. We think you’ll appreciate our larger than average photos, whole-screen floor plans and energy ratings, and our user-friendly maps so you know just where you’re looking. Another advantage of our new site is that it is viewable on smart phones and tablets. And if you’re the kind of person who likes to have a hard copy to hand, you’ll like our downloadable print-friendly PDF property guide. So whether you’re looking for a permanent home or a holiday hideaway, we hope our new website will enhance your property-search experience. We welcome your feedback, so let us know what you think.